I don’t need to tell writers, or readers for that matter, that for publishing ‘the times they are a changen’’. I’m trying to keep up but not always succeeding, especially in my mindset concerning social media. In this piece I will truly show my age. In the past, that is my past, writers seemed to be more elusive than they are in today’s world of publishing. They would publish, perhaps appear for a short time in public, and then return to pursuing their craft. In today’s environment of constant communication and media exposure, if a writer is not constantly tuned into social media and making the public aware of their every thought through tweets, Facebook, blogs (such as the one you are reading now) and websites, they will fall by the wayside. Granted, once you are well established as a writer those avenues to the public are less important. But even those lucky authors who dare to turn their back to social media are at risk of losing their access to the public. My mind wanders along these avenues of thought. My fellow writers: What do you think? Okay, sit back from the edge of your seats. Here’s some hints as to who the character is and the reward I’m offering. First, as you all know by now, I have a profound love for books. In New Moon Rising the character shares the same love and, in the story, is on my dream vacation. What’s his name? As for the prize, it is twofold. Now you’re back to edge of your seats again. I can feel it. First, you will receive a signed copy of my e-book, Elmo’s Sojourn, mailed to you as a printout. Also, you will receive a copy of my, as yet, unpublished manuscript, Elmo’s Invention, which is a prequel to the e-book. That’s it, my friends. I’ll alert Amazon to expect the rush to buy my novel. To ease your buying enjoyment, here’s a link to my work for sale by Amazon. 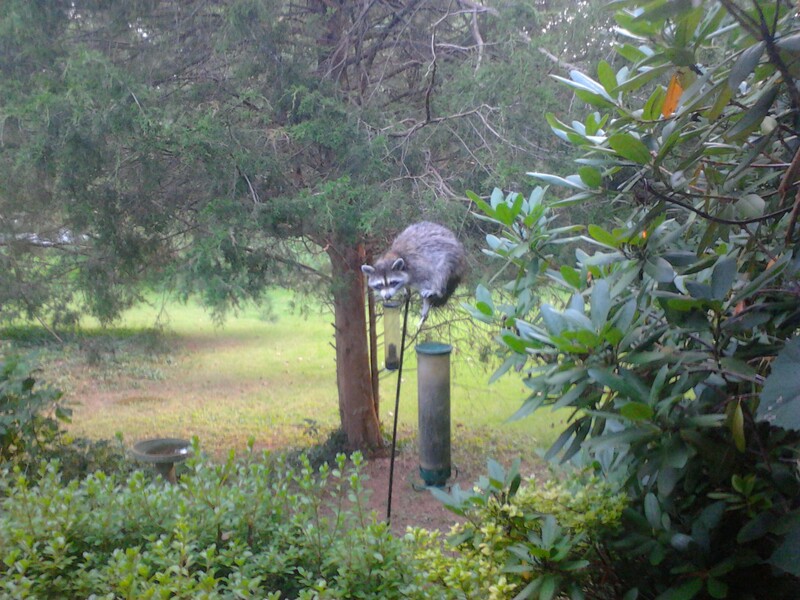 It may be time to upgrade our squirrel-proof birdfeeder after this new challenge by the masked intruder. Believe it or not, this is in a sense, a memoir piece. We live a suburban life where homes occupy half-acre lots. Not far from home are fields of corn and stands of forest. Our piece of land is bordered by a gully, once the home of railroad tracks. Overgrown now, it is a natural highway for wildlife. Groundhogs and fox have made dens in the gully’s confines. The groundhogs can be seen lumbering around the front and back yards, or heading towards my garden. Foxes can be heard more than seen, although on winter afternoon I caught the sight of a red fox against a new snow. Summer nights they call, to one another or pierce the tranquility with a rabbit kill. In recent years, deer have appeared in the gully, up to five does occasionally accompanied by a buck, a sure sign of the species overpopulation in the area. Also, a sign of danger for our road is a busy one. Skunks are around, but see almost never only smelled. The birdfeeder pictured attracts a host of birds, chickadees, cardinals, titmouse, goldfinches and the occasional woodpecker. Now, for two day running the sunflower seeds have also attracted our masked visitor. “How is this a memoir piece?” those of you still with me are probably asking. The observations above reinforce in me the memories and contrast in my mind my present conditions and those I experienced while growing up in Newark, NJ. When looking out on the tranquil area I call home, I recall our backyard in Newark, dirt and cinder, defying the growth of grass. 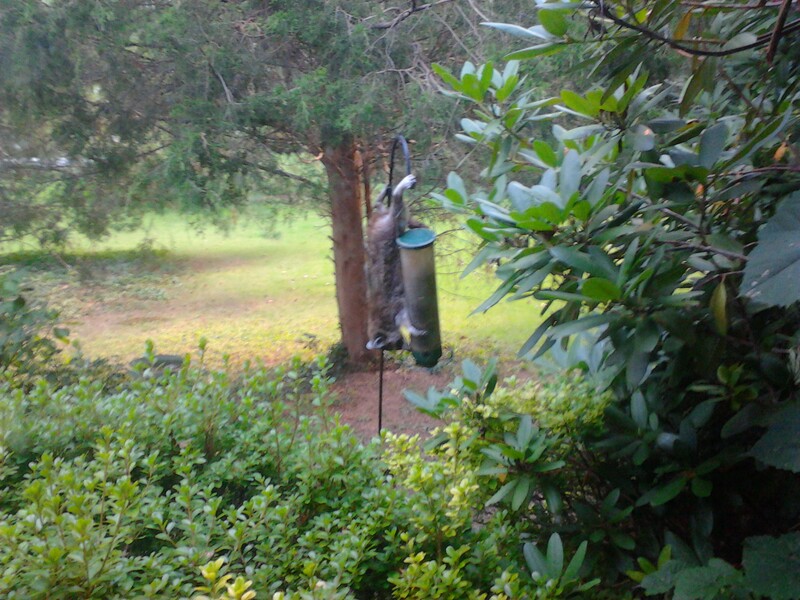 Our wildlife consisted entirely of squirrels. Our birds were limited to sparrows and starlings, with the occasional robin looking forlorn and confused. Those distant memories help me appreciate the surroundings I inhabit now, help me appreciate my Pennsylvania home. Some future day, I hope to spend part of the year near the ocean. Its vastness provides a ceaseless source of peace and contemplation. I could never live on its shore year-round, for I fear that that endless body of water would become commonplace and lose its magic. My Newark youth provides no problem in keeping the wonders of nature in prospective.